Hello everyone, one of my favorite questions to answer is also one of the most frequently asked questions as well. 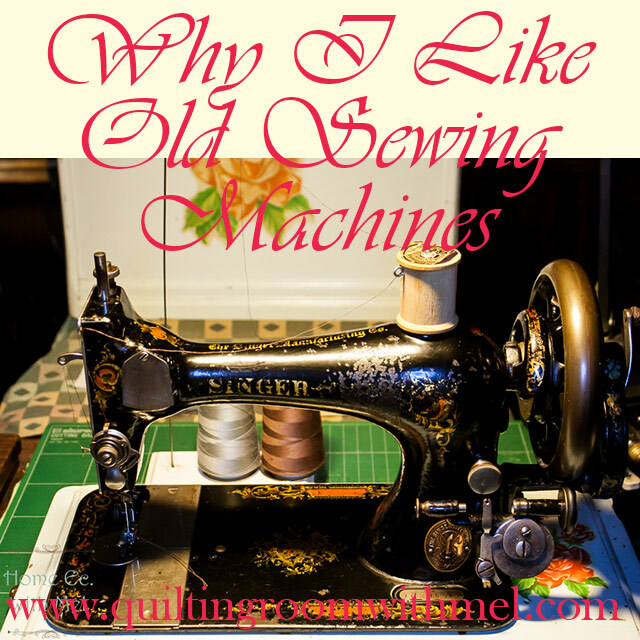 Why do you like the vintage sewing machines? 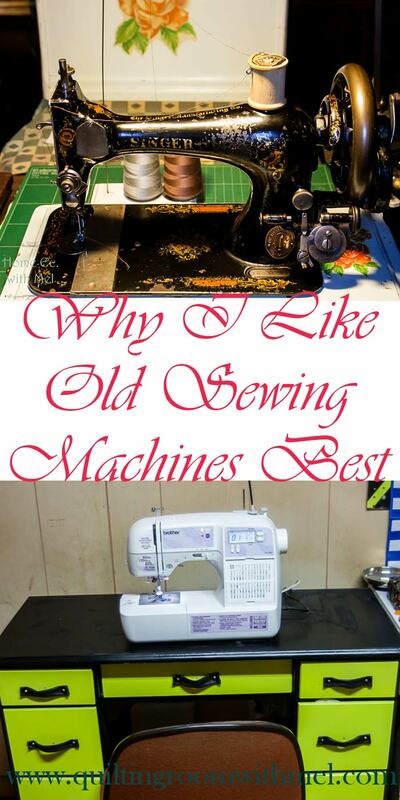 So today am going to voice my opinion and share some of the things that I like about the older sewing machines. This means we will also discuss some of the things that I don’t like about some of the newer sewing machines. This post may contain affiliate links. Purchasing items from the links cost you nothing more and will add a few pennies to the fabric budget. Honestly, I enjoy all kinds of sewing machines and I do appreciate the technological advances machines have accomplished. I am impressed by the ability to program a series of steps into a sewing machine, set up the fabric, start the machine and walk away, only to return later and have the project completed. I can also enjoy the ability of the sewing machine to create hundreds of special stitches with the push of a button. I like the ability to choose how my needle is positioned up/down for me, without having to watch and roll the handwheel until I get the needle where I want. These are just some of the basic processes that are made extremely easy for us by the computerized software is driven sewing machines. Whenever I pick up one of these new marvels to move it around I can appreciate the weight these machines have lost. Some of the weight loss can be attributed to the use of plastic gears and positioning arms on the inside of the machines. But most of the weight loss comes from the use of plastic bodies and body panels attaches to a skeletonized substructure resembling an Erector set from my formative childhood. The use of stepper motors and sensors to position the needle and operate the feed dogs almost completely superseded the need for a main and counter shaft. Subsequently, the weight loss of the shafts was offset by the tiny stepper motors. Not only did the use of plastic throughout the machine make it lighter, it also made them more economical to build. Plastic can be molded and machined quicker, easier, and less expensively than steel, cast iron, aluminum or brass. These savings were, in turn, passed along to the consumer. An average customer could now buy a machine with a seemingly endless library of pattern stitches, lighter, more portable machine. At a fraction of the cost of an all steel bodied heavyweight with about 10 different pattern stitches and usually required some form of cam discs in order to make the various stitches. Now that we have determined the positive attributes of the fantastic plastic sewing machines and we have acknowledged the benefits inherent to the technology, I would like to fulfill the circle of life for the vintage sewing machines. In the process, it should become apparent why I prefer working with the scrap iron rejects. Although the computerized technology we find ourselves surrounded with, has steadily improved, electronics inherently have a limited useful lifespan. Unfortunately, there are very few options when it comes time for the electronics to be replaced. If we are lucky we may find a distributor who has replacement parts on a shelf in the back of the workshop. But what I have experienced is the parts are no longer available after 8 to 10 yrs. Sewing machines are not the only victim when it comes to engineered obsolescence. Unfortunately, without the exact replacement, the machine is useless. When one of the vintage machines doesn’t want to function it is generally stuck from sitting and can be cleaned and oiled and once freed of debris, it will function as good as new. Or it needs new brushes in the motor or a new motor and maybe a belt. If it becomes necessary to replace or repair a part on a vintage machine, the parts can both be repaired and or re-machined. Or they can be completely manufactured by any skilled machinist. I am not saying that the electronics could not possibly be done the same way but rather that there are more mechanics that can cross over their field of expertise, than there are electronics engineers or software programmers who can build a circuit board from scratch and rewrite the command string for the memory so the machine can function. Since the end result of hardened oil and rust is the same,(frozen/stuck) and the solutions are the same. (Basic cleaning and lubricating) I bundle the two of them into one problem. The second biggest problem for the vintage machine is simply aging wiring. After a couple decades of, use, the insulation on the wire starts to degrade and the wiring for the motor, controller, and the light starts getting ragged and needs to be replaced. Again another very simple repair that can be accomplished by anyone with patience and common sense. Keep the phrase “couple decades” fresh in your minds because we are going to refer back to it when we get further into the post. As we go into the various comparisons between the vintage sewing machine and a new superplastic machine one of the biggest controversy’s and possibly contradictions, stems from the use of plastic gears and guide arms or positioning arms. The benefits of the plastic gears consist of cheaper, easier to produce, and some would say they are quieter. I agree with cheaper, and I understand easier to produce but I am not so much in agreement about the noise. Plastic gears are quiet when they are properly adjusted, but so are steel gears. The disadvantages of plastic gears are the same as the advantages, they are cheaper to make, they wear out much faster and they will harden with age and crack or start losing teeth and need to be replaced. The plastic gears are more subject to timing issues due to heavy usage than all steel gears. When they are used in sewing machines that clearly specify they will handle denim fabric the life expectancy of the machine is reduced greatly. From my experience with this type machine, I would say their life expectancy is reduced by 66%. The gears wear faster and they flex more. As a result of the combination of the, two, they tend to be a timing nightmare after being used a short period of time. When this is combined with a plastic body over a skeleton frame the problems are compounded again as these frames tend to flex and warp over time. I don’t expect a long life from any gears whose alignment is compromised by the flexing of the support system which is intended to keep the gears solid in relationship to each other. Just to be fair and unbiased steel gears supported the same way will also fail. The failure may not be the steel teeth, It will, however, wear the support system faster because the teeth do not give in to the pressure applied to them, therefore that pressure is, in turn, passed further down the drive train where the pressure is absorbed by the bushings that hold the shafts in place and into the framework itself. In my opinion, I believe this exact circumstance is the cause of the innovative stepper motors and the sensors which are computer driven to keep the timing of the feed dogs and the needle on track without the use of gears. The one final comparison I will share an opinion about is really subjective. It will deal with the weight of the machines, Plastic vs. Steel. When it comes to transporting or carrying portable machines the plastic portables win hands down. All metal machines just don’t have a chance. Some of the smaller ½ size machines like the Singer featherweights, Bell machines, Lotus machines, Grasshoppers and I believe the Kenmore 10 series would probably come the closest to giving any competition in the weight class. Downfall, some of these machines are SS only machines. I am no expert on most of these machines so I won’t go into details I can’t verify. What I can verify from personal experience is when using the lightweight machines it is sometimes very difficult to keep them from walking all over the table while sewing. Also when sewing anything with weight to it the machines tend to slide around when you are trying to position the fabric across the needle plate. Just to elaborate upon the weight of the project being sewn I was making lap quilts. I was using fleece for the back on two of them and I used all natural cotton batting on two of them with regular quilter’s cotton for the back. However, when I set the machine on a piece of non-slip shelf liner it helped the situation immensely. Ok now that I have explained what I believe to be the mechanical advantages and disadvantages of the machines I would like to say that I personally believe that every machine has its own value and it doesn’t really matter what my opinion is. After all, my situation may not mirror yours. If you use a fantastic plastic machine and it makes you happy and it does what you want it to then, by all means, use what you enjoy the most. As for me, I, do prefer the older scrap pile rejects. Remember earlier I said we would refer back to comment I made about decades. Well here we go I have not seen a single Iron body steel geared machine that that didn’t last for decades. Motor replacements or rebuilds are to be expected with any machine new or old. By design, the brushes wear out with use. Other than that the old heavyweights ask for very little repair that was not the result of abuse. It the needle keeps getting pulled over the plate and the machine is knocked out of time after a hundred broken needles then it probably reflects operator error rather than poor construction. Re-time the thing and it is good to go several more decades. Personal experience has proven to me that no matter how badly stuck or rusted a machine is if it is able to be cleaned and freed up it will sew. As long as the main shaft will rotate it will make stitches. If it doesn’t sew like a new machine it generally means there is a rough spot overlooked and it needs more attention. I like working on them and bringing them back from the scrap piles and giving them a new lease on life. My final thought on this subject has to do with history. When the older machines were built most of the fabric they were designed to sew through was natural fiber construction. Cotton, linen, and wool were the primary fabrics sewn. There were a few silks but even the silk was as heavy as some of the lightweight cotton of today. Because the fabric was inherently thicker the machines were designed stronger as well. This simple fact means an average vintage machine will perform like an extra heavy duty machine by today’s standards. But they will not take the place of an industrial machine. This is just my thoughts and opinions, If they work for you that’s fine, If they don’t it is equally fine. I wish you all the best of luck and I hope you all enjoy your machines your own way. Until next time may you never run out of thread before you run out of a project. Very well said, Paul. I have had a lovely 1890 White treadle in my possession for about 40 years. It has mainly been used as a plant stand (yes, I will admit it!) and a computer table. Since finding Quilting with Mel, I have a renewed commitment to getting it operating again. I never really knew what to do to get it going. After opening it up recently I realized it is not in as bad as shape as I had thought. The leather belt is not even broken, but probably too old to use. I don't know how to get the belt engaged again, but I'm sure I will be able to figure it out from your videos. I don't see rust on the machine, but it does need a good cleaning. Thank you for all you do!